854 East Oakland Park Blvd. My dog is slowing down. Is it hip dysplasia, how do I know for sure, and how do I treat it naturally? Puppies grow up incredibly quickly, with most dog breeds reaching their full size within 8 to 18 months. Unfortunately, we’ve seen in our Fort Lauderdale clinic that this rapid development comes with an increased risk of certain diseases and injuries, including hip dysplasia —a degenerative condition that causes a dog’s hip joints to develop abnormally. Hip dysplasia has serious symptoms including pain and mobility problems. Fortunately, it is possible to treat hip dysplasia in dogs naturally — even without visiting our Fort Lauderdale office! This blog post will explain the causes of hip dysplasia, how it is diagnosed, and the ways you can treat hip dysplasia in dogs naturally. A dog’s hip joint consists of a rounded hip socket which the ball of the femur (the highest leg bone) fits into. Hip dysplasia occurs when the hip socket is too shallow or the femur head is deformed, creating a loose connection and abnormal cartilage wear. This condition can also cause painful inflammation in the hip (osteoarthritis). In the early stages of the disease, your dog may exhibit an unusual gait which looks similar to bunny hopping. As the disease advances, they may struggle with mobility and can experience some pain. Most cases of hip dysplasia are caused by genetic factors, with certain breeds being more likely to have the condition. Unfortunately, because the hip dysplasia involves multiple genes, it is difficult to identify which dogs have a higher risk of the disease. Even if a dog’s parents are completely clear of the condition, they may still carry the genes that cause it and pass it on to their puppies. The breeds that often carry the genetic defects causing hip dysplasia include German Shepherds, Labradors, Great Danes, Saint Bernards, Rottweilers, Neopolitan Mastiffs, and American Staffordshire Terriers. It tends to be more common in fast-growing breeds but can also effect some smaller breeds, including pugs and bulldogs. This form of the disease is usually referred to as early onset hip dysplasia and begins to occur in dogs as young as 4 months old. Researchers are working to identify all of the genes that are responsible for hip dysplasia. 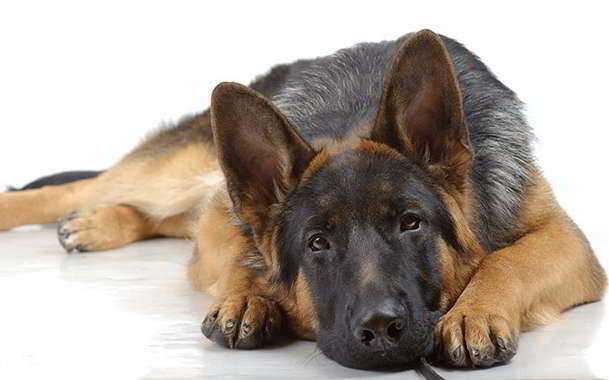 Scientists from the University of Veterinary Medicine Hannover recently identified some of the genes that are responsible for hip dysplasia in German Shepherds. There are also some services available to assess the risk of a dog having this condition, including the PeenHIP screening service. Using these services can help you identify if your puppy has a greater risk of having the condition and allows you to take action early on. Late onset hip dysplasia is usually caused by osteoarthritis, an inflammatory condition that causes the cartilage in the joint to deteriorate. As the cartilage in their joints deteriorates, the hip socket and joint become loose. This form of the disease often occurs in working dogs who are very active. A wide range of environmental factors can cause hip dysplasia, including poor nutrition, poor muscle development, repetitive strain injuries, rapid weight gain, obesity, and pelvic injuries. How do you know if your dog has hip dysplasia? To diagnose the presence of hip dysplasia, your vet will perform a complete physical exam and may take some x-rays. It some cases, it is possible to diagnose the condition based solely on the symptoms and looseness in the dog’s hip joint. A laxity test is often performed, which assesses how far the hip joint can be rotated without causing discomfort to the dog. What are some of the ways to treat dog hip dysplasia naturally? Fortunately, it is possible to treat hip dysplasia in dogs naturally! When these techniques are performed consistently, you can obtain some incredible results in dogs with this condition. Your dog will feel more comfortable and can even regain some of the mobility they may have lost. The single most effective and important treatment is maintaining a healthy weight. If your dog is overweight, they will be placing more strain on their joints which increases the pain and inflammation they experience. In fact, reducing weight down to a very lean, almost skinny level could go a long way to restoring more natural activity. Ask Dr. Jessie or your regular vet for some help creating a safe weight loss program for your dog. All dogs diagnosed with hip dysplasia can benefit from physiotherapy. It can make your dog more comfortable and help them regain their mobility. Here at Healing Paws Center we can create a physical therapy regimen through our professional dog physiotherapists. We can also provide you with some information so you can perform basic physiotherapy on your furry friend at home. Physical therapy usually includes a combination of massages and joint mobilization movements. It can also include the use of heat packs or cold packs to help with mobility and swelling. Hydrotherapy can deliver excellent results for dogs with hip dysplasia. This therapy involves the use of an underwater treadmill or exercises in a swimming pool. The buoyancy of the water reduces the amount of pressure on your dog’s joints and allows them to exercise their rear leg muscles with much less pain. As the rear muscles strengthen, they will regain some of their mobility. The food that your dog eats has a significant impact on their health. Some dog owners have seen some dramatic improvements in the condition of their pet by switching to wholesome diets that are focused on natural foods. These diets include both cooked and raw meat, vegetables, and bones. You may find our food therapy and nutrition programs are a great place to start. If you have a puppy that has been diagnosed with hip dysplasia, special diets designed for rapidly growing dog breeds may help to reduce the severity of their condition. These special diets work by helping your puppy’s bones and muscles grow at an optimal speed. There are a variety of natural supplements that can reduce joint inflammation, increase joint lubrication, and help to rebuild damaged cartilage. NOTE: it is always recommended to discuss any medication with your vet before starting. Practitioners of Traditional Chinese Veterinary Medicine have the training and experience to deliver safe and effective results. You can find a certified practitioner like Dr. Jessie by searching the American Association of Traditional Chinese Veterinary Medicine website. Practice sitting and getting back up for both strengthening muscles and stability. It is important to start with just a few sits – don’t overdo it. Balance exercises are great. Smaller dogs can stand on a balance ball or board. You can also practice having your dog raise one front paw and then the other, and practice walking on uneven surfaces. Walking inclined surfaces is a simple way to increase muscle development. Upward inclines work the rear limbs, downward inclines work the front limbs. You can purchase special orthopedic mattresses that prevent the dog from placing all of its weight on its joints. These mattresses can help your dog get more rest and makes it easier for your puppy to get up after resting. Many dog owners have turned to acupuncture to reduce the amount of pain their dog is experiencing. There is a documented close correlation between the acupuncture points and the peripheral nerve pathways of the body. Thus, stimulation of an acupuncture point can dramatically reduce the pain in the joint and limbs. Dr. Jessie is a Certified Acupuncturist, click here to learn more about how acupuncture for dogs and cats can help. The key to successfully treating hip dysplasia is to diagnose it as early as possible. Once diagnosed, your vet can help you create a plan of action that reduces any pain your pet is experiencing and helps them retain their mobility. With the help of these natural treatments, your dog will enjoy a very long and happy life! Be a part of our community and get awesome tips, advice from our expert staff, and some fun delivered right to your inbox. Sign up now! Dr. Jessica Dreyfuss (Dr. Jessie) has had a passion for helping animals since she was very young. She graduated with honors from Duke University with a Bachelor of Science and received her Veterinary Degree with honors from North Carolina State University College of Veterinary Medicine, which ranks #3 in the nation for veterinary schools. Dr. Jessie is a veterinarian, Certified Veterinary Acupuncturist through the Chi Institute, and a Certified Canine Rehabilitation Therapist through the Canine Rehabilitation Institute. She is also Certified in Food Therapy, and in the use of a therapeutic Class IIIB laser. She is an active member of AAVA (American Veterinary Acupuncture), AARV (American Association of Rehabilitation Veterinarians), and AHVMA (American Holistic Veterinary Medical Association). What Should I Feed My Pet – Pets Are What They Eat! Infrared Imaging (Thermography) for Pets – Giving a voice to your pet! Degenerative Myelopathy In Dogs – What Can You Do? Specializing in Acupuncture, Herbal Therapy, Rehabilitation and Nutrition / Food Therapy Plan for Your Pet Proudly serving the cities of Ft. Lauderdale, Wilton Manors, Boca Raton, Miami, and their surrounding areas. Great tips for your furry friends right in your inbox. Learn how in our free newsletter. Get awesome tips and advice from our expert staff, delivered right to your inbox. Sign up now! You’re one click away from awesome tips and news to help make your furry pal’s life better.